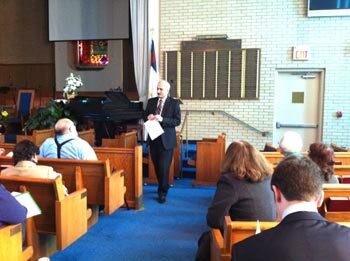 New Jersey Council of Churches invited the Ceo. of the Interfaith Dialog Center Dr. Levent Koc, to give a speech on theair annual meeting on on Saturday, January 15th 2011. Dr. Koc's topic was Tolerance, intolerance, interfaith relations – Islamic Perspective. He started with explaining some verses misunderstood/misinterpreted that cause intolerance. He then focused on freedom of religion in Islam includiing freedom scholars of religion. After expaling of status of the people of the book in Islam, he gave examples of tolerance and living together from Muslim and Turkish history. He finally talked about Muslim engagement in the non-Muslim Community. He concluded with "Action Today".